The MacGillycuddy's Reeks and Carrauntoohil Entire Mountain Range Walk from the Gap of Dunloe to near Lough Acoose is a rewarding but strenuous to difficult 10-12 hour (21km) long walking route over the entire MacGillycuddy's Reeks Mountain range near the town of Killarney, Co. Kerry in the south west of Ireland. 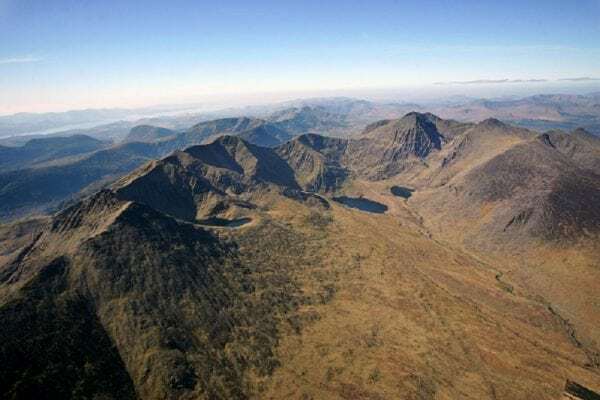 This is a tough full day hike with amazing views over the Reeks and Black Valley and steeped in Irish Mythology where you walk in the footsteps of the Fianna. This walk is part of the 2014 Killarney Walking Festival from 20 to 22 June. Register for the guided trip here www.killarneywalkingfestival.ie. The route can be done in either direction so please view the full route map below and on our Free App here. Starting from Kate Kearneys Cottage in the Gap of Dunloe you start gently on the slopes of Stickeen Mountain (440m). 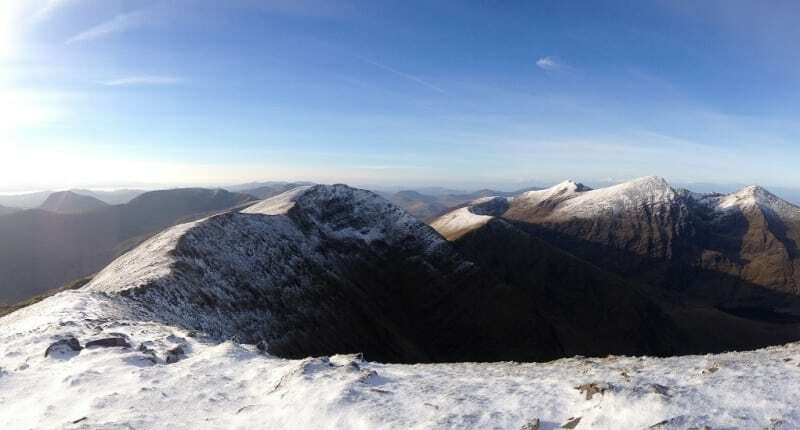 From here you traverse the Eastern Reeks over summits including Cnoc an Bhráca (731m), Cruach Mhór (932m), The Big Gun (939m), Cnoc na Péiste (988m), Maolán Buí (932), Cnoc an Chuillinn (958m), Cnoc na Toinne (845m) and finally to the summit of Carrauntoohil (1,039m), Irelands highest mountain. From here you can choose a side trip to visit Beenkeragh (1,010m) before returning back along the same route to the peaks of Caher (1,001m) and Caher West (975m) before descending to the Hydro Car park near Lough Acoose, Glencar. 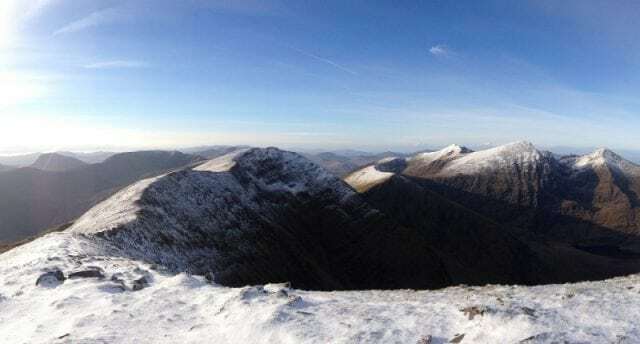 Or alternatively you can continue from Beenkeragh (1,010m) on the northern side of the Coomloughra Horseshoe to the peaks or Skregmore (848m) and Cnoc Íochtair (747m) before descending to the car park. A shorter route option is to begin or finish with Cruach Mhór (932m) with Cronins Yard as your start of end point. The walk passes through an area where Fionn MacCumhail of Irish Mythology and the Fianna, his army of warriors and hunters hunted deer with their famous pack of 500 Irish Wolf Hounds. This walking route starts in Derrynafeana meaning 'Oak Wood of the Fianna' and rises to Ireland 3rd highest mountain Caher (1,001m) or Cathair na Féinne, meaning 'Stone fort of the Fianna'. Look west from Caher to the nearby mountain Seefin or Suí Finn in Irish meaning ‘the Seat of Finn’ (fionn). The fact that these Irish Mythology names of places and mountains have survived for so long, suggests that these were real people that lived, stories were told about them, and over time these stories were embellished with magic, fantasy and myth to keep them alive through the ages and I guess it has worked!! 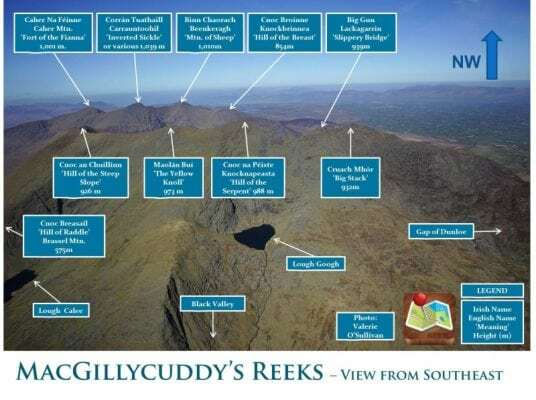 This route requires some careful scrambling on the Eastern Reeks on the ridge between the Big Gun (939m) and An Cruach Mhór (932m) on the exposed Beenkeragh ridge so a guide may be the best option for those with less mountain experience. This walk requires a full day. It is not advised to undertake this walk in poor weather or high winds due to the exposed ridges. If times and weather allows, this is one of the best walks in Ireland and offers you some great views back towards Killarney and west into the Iveragh Peninsula and to the Beara Peninsula if you are lucky. It is only a short drive to the Reeks and Gap of Dunloe from Killarney or Tralee, which are in the south west of Ireland in County Kerry and the route is just off the Ring of Kerry and Wild Atlantic Way. Click here to book a walking guide with John from The Lodge and Reeks Guiding Company. 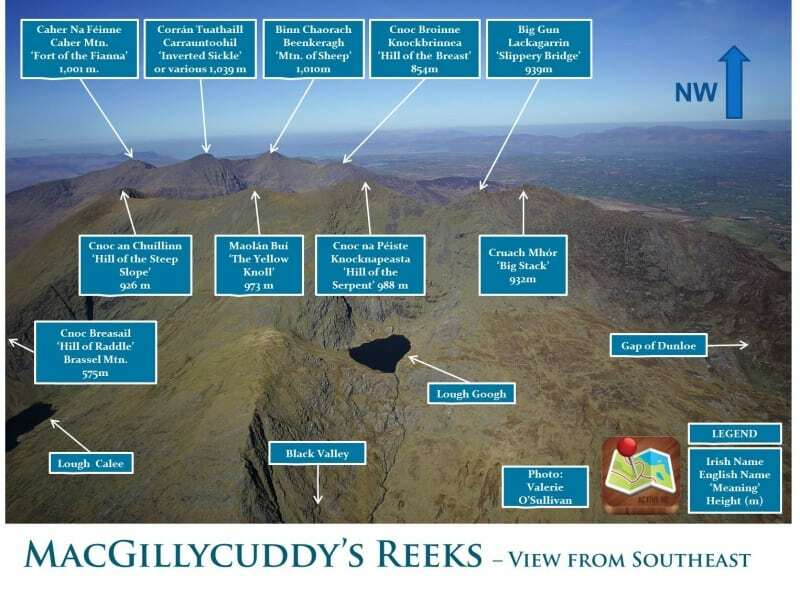 There are plenty of other routes to suit beginners to advanced walkers on the Reeks, so please find a route that is right for you or your group. Plan your walk by checking the weather, sunrise sunset times and our hiking checklist on our website https://www.activeme.ie/useful-info/planning-a-trip/. Please remember that you are only as fast as the slowest member of your group! It is also better completed after a spell of dry weather and allow plenty of time. Use our Map of Ireland and Sat Nav tool to get directions to the start point and our detailed maps and GPS on our ActiveME iPhone App and Android App to find and follow the walking route live on screen and keep on track. Our maps and Apps are only a rough route guide and at all times should be used in conjunction with proper map and compass navigation techniques.